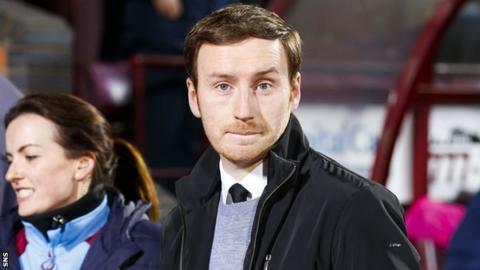 When cutting about Edinburgh, Hearts head coach Ian Cathro tends to wear a hat, mostly, he says to disguise his "forthcoming baldness", a follicle challenge - looking at his bonce, it's far from a crisis, it has to be said - to go with the football project he has taken on at Tynecastle. Maybe the cap fits in another sense. For a man whose appointment caused such a hubbub, Cathro is not exactly high on the radar of the Edinburgh public. Nobody has recognised him on the street, nobody has picked him out as the Hearts boss that everybody in the media went doolally about when he was appointed five games ago. "I'm pretty anonymous out there," he says. "That's the way I like it. I like being anonymous away from football." Cathro is in the John Robertson Lounge at Tynecastle, the pitch to his back. The new structure that will be built up and over this soon-to-be demolished stand is beginning to take shape. There's a lot going on. Builders everywhere. He's supposed to be a builder, too. Of sorts. Hearts have played five games on his watch and have won just one of them, with one draw and three defeats. He gives himself a mark out of 10 so far. "A big fat zero in a lot of ways," he says. "Maybe that's unfair, and a bit tongue-in-cheek. Things could have been better. We've made some mistakes. Some of them were collective, some of them were mine. We're just getting started." Cathro has his fans and he has his critics. We know about the soap opera that unfolded around him when he was announced as Robbie Neilson's successor, a madcap flurry of analysis of a guy that very few of us actually knew a whole lot about. Here he is, though. Wednesday afternoon, relaxed, using his favourite word - "work" - over and over. Are Hearts underperforming so far? "Yes, we should have more points from the five games." Have the losses impacted on his confidence? "A straight no. I focus on the work. If our work is good, the wins will come. And it will be good. I know very clearly where we want to go. We won't veer off path." We won't dwell on Kilmarnock's Kris Boyd and the laptop coach stuff. Everybody has had a belly-full of that already. One question: what did he make of it? "I have to tell the truth, I didn't pay any attention to it," he responds. "Everybody outside my house was [talking about it] but nobody inside my house was too concerned. These things go on. I think people will learn, through time, that it would take an awful lot more to knock me off track." Cathro, in case you've been hiding underground for a month, is 30-years-old and has packed a lot into his career. A youth coach at Dundee United, then lured to Rio Ave in Portugal where he was assistant to his great mentor, Nuno Santo, onwards to Valencia, where with Santo as boss they finished fourth in La Liga and made the Champions League. After that, he went to Newcastle as a coach under Steve McClaren and, then, Rafa Benitez. Quite a CV for the new Hearts head coach, who, depending on your pundit preference is either a very shrewd appointment or an ill-equipped, over-promoted, oddball. There's no getting away from the fascination of his back story. Santo and Benitez are characters he has learned from when it comes to handling challenging situations. "Both Nuno and Rafa deal with those things well," says Cathro. "You'd probably look to Rafa because he's lived through more of them. He's had a real stark contrast of experiences. He's not always been one of the top managers in the world. "You reach a point where a combination of knowledge and experience brings comfort and calmness and clarity and those are the things that allow him to make good decisions more often than not. From them, I learned how to be a coach, I learned how to be a manager. From Nuno, I learned a little bit of how to be a man. "Leaving home, going to Portugal, not a word of Portuguese, a young guy, 24 or 25 at the time. Not an awful lot of life experience. Probably more football experience than life experience at that point. Every aspect of life there demanded that you grow up. That was a very valuable thing. "I've never accepted being told that life should be like this, you do these things and that'll be you and everything will be fine. I've never been comfortable with that idea. I think I've always had bigger and stronger aspirations and a belief that with work we can do anything we want. I've probably given some evidence [at Rio Ave, Valencia and Newcastle] that that's true and, naturally, when you surpass some challenges then you believe you can keep going. I'm just going to keep going." It's a painfully early moment in his time at Hearts, but plenty has happened already. A poor performance at Ibrox, a lucky point at home to Partick Thistle, a 2-0 lead that turned into a 3-2 loss at Dundee, a 4-0 shellacking of Boyd's Killie and a passive defeat at home to Aberdeen. On Sunday, there's a Scottish Cup tie against Raith Rovers, who might as well run out in maroon such is the ex-Hearts influence running through the place. Men on a mission, you might say. A cup run? The lack of one was a stick that was regularly used on Neilson. "Listen, on Sunday, we want to win the first 15 minutes, then the next 15, then the 15 after that," Cathro says. "We don't want to play well for the sake of playing well. Without winning, everything else is a waste of time. All of us want to get to the same place." He knows that Hearts supporters can be among the most demanding in the country, but he smiles at that. Cathro is either a very good actor or else he is utterly at home with the burden of expectation at Tynecastle. "We want this," he says. "I want pressure, the players want pressure. Sometimes the environment has to be there to push you. We want to achieve things of significance here and not just feel comfortable and get a little pat on the back." After the Aberdeen game he made a comment that might have jarred with the Jambos. He congratulated his players for getting to half-time at 0-0. Did they deserve applause for that? "There's a context," he explains. "It probably should have been 4-0 Aberdeen. In the opening part of that game we all know we didn't win that battle and we suffered. We all want to play well, but what we must have is the willingness to suffer and stay alive. We were suffering but we stayed alive and that's the backdrop to that. "The Dundee game, I don't think you find games like that too often. Momentum swung and in matches like that we need to do whatever we need to do to stop the tidal wave coming over us. We didn't and we suffered because of it. What did it give us? It gave us a slap in the face. You learn the lessons and get better." Players are coming and going at a fair old rate. Four out, four in so far. Hearts still look short at centre-half and centre-forward, an observation that Cathro doesn't argue with. There might be more business done, but he won't be distraught if there's not. He's brought in Malaury Martin, a 28-year-old French midfielder, Aaron Hughes, the 37-year-old Northern Irish defender, Andraz Struna, a 27-year-old Slovakian full-back and Leonard Sowah, another full-back, 24, signed from Hamilton. "Malo brings experience and an understanding of football in a similar way that I understand it," says the Hearts head coach. "He's a little bit more offensive in the midfield. Aaron gives us a grown man with fantastic experience at the highest level. We have a couple more grown men in the team. That was one of the things we wanted to address." What does he think Hearts fans make of him? "I'm sure that's quite varied just now," he responds. "The only thing that's important is that they come and join in this early part of the ride because I wouldn't want them to miss out this bit and only join in the later stage. We're going in a certain direction and I want us to all go together. "The support is one of the reasons why I want to be here. This club has a life, a power. I want football to matter to people - and it matters here." There was talk, pre-Mark Warburton, that he had a chance to go to Rangers. "I wouldn't use those words exactly," he adds. "There were conversations, but I wouldn't linger on that. No. This is the place."